Hi all, just got a much anticipated delivery at my door today, a new Langes/Grosses Messer from Armory Marek in the Czech Republic. 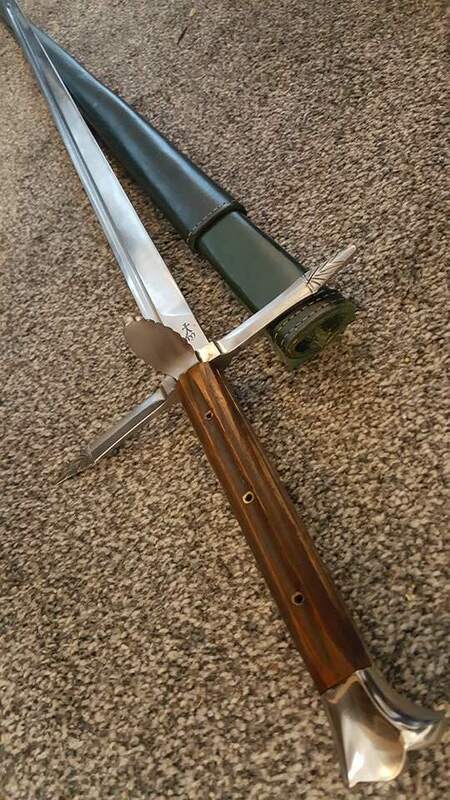 I'd been toying with the idea of having a messer to use for my local reenactment group, however there are very few bladesmiths that offer a good variety of Messer designs at an affordable price. fortunately I stumbled across Armory Marek after finding a youtube video in which his products were featured. After taking a look at their stock I was very impressed by their variety and almost too good to be true level of quality. This coupled with their very affordable price list made me very suspicious of Armory Marek. However, After much deliberation I decided to take the plunge and see If I was about to get the sword of my dreams or a lemon. I'm pleased to report that my expectations have been exceeded and I've received an incredible piece of kit that is almost heirloom quality, time will tell on its durability, but nothing I've seen and felt has lead me to believe it will be quick to deteriorate. 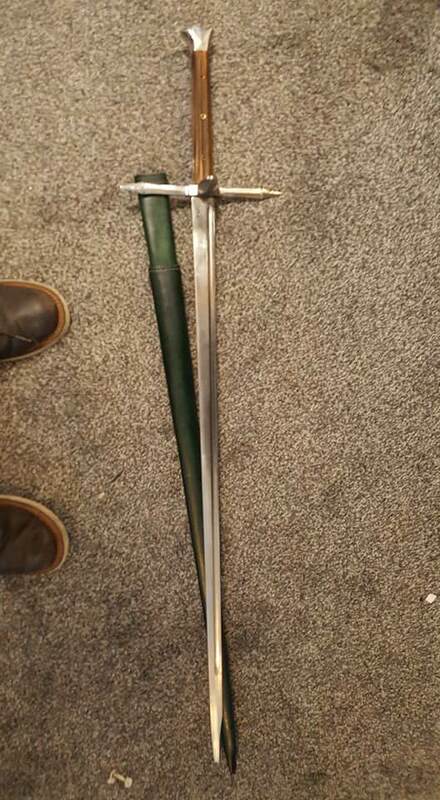 I'm yet to spar with it but I can show you guys the specifications, my overall first impressions of both the sword and my dealings with Armory Marek, and some photographs for you to ogle over. I consider this a very reasonable price for what I received. This was my first purchase with Armory Marek, and I can't really complain about anything, communication was prompt and informative and Pavel was more than willing to answer any questions I had about his products before I ordered. It's fair to say I was impressed with his service (especially as I corresponded in English and this isn't Pavel's first language) as a criticism however, I would say that it would be useful to have the price list on his website rather than by an email request. Another thing that concerned me was that he does not accept paypal payments, only allowing cash or direct bank transfer, obviously this worried me as it left me with no recourse if I was scammed, however I have heard from other reviews that he's a very honest business man, and is more than willing to offer refunds or pay for returns if there is anything wrong with the product, and I have no reason to believe he would have treated me any differently. His delivery came quickly, less than two weeks after it was initially posted, shipping from the Czech republic to North Wales. 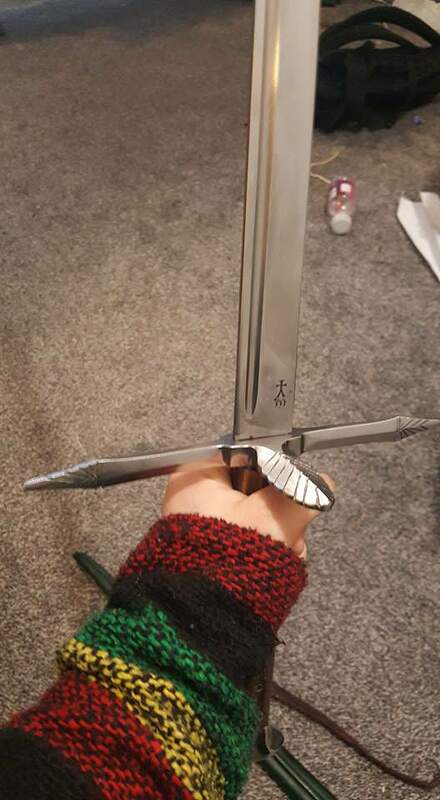 I may be gushing slightly but, I'm very impressed with this sword, it feels very responsive in the hand and it has an impressive amount of blade presence for such a light blade. The blade is a good thickness and has a very agreeable level of flexibility, not too stiff and not too whippy. The crossguard is very well designed and although the filework gives it a slightly "fantasy" esque look, I think it still looks quite utilitarian while still having a slight amount of personalisation. These features don't detract at all from the handling of this weapon. Its size was perfect for my needs (102 cm), as it is very well suited for "hand and a half use" that is, it's maneuverable and light in one hand, yet has just enough grip length and a very comfortable pommel which tends to "cup" the pinky of the second hand when used two handed. I was uncertain whether I wanted a purely two handed or purely one handed messer, but I'm very pleased that I can seamlessly use it in both fashions with no real detriment to either. The fit and finish is nice, although slightly lacking in some respects, the hollow rivets aren't filed perfectly flush, but I find unless I really dig my fingers into the groove in the grip, I don't feel them. The scales themselves make for a very comfortable handle, but again aren't perfectly flush at all joins, but this is only apparent upon close inspection. There is a slight concern I have as one of the scales tends to shift ever so slightly during certain one handed cuts, however I'm confident that the three rivets will hold this in place securely, without it being too much of an issue. I plan to let Pavel know about this concern to see if he offers any repairs or replacements in the case of it breaking under non stressful use I.e "dry cutting". All in all I feel as though I got more than what I paid for and I'm very impressed with the craftsmanship. 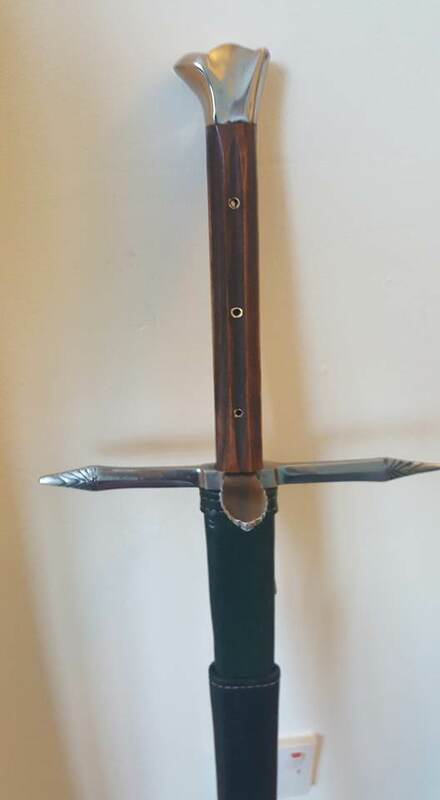 The scabbard is fairly simple, however it was very cheap and at least fits the blade snugly, the sword stays in when tipped upside down and only a large amount of shaking will make the top 4 inches of blade slip out. Aesthetically I think the scabbard is very pleasing, the dye job is well done and the leather seems thick enough to offer good protection and durability. As stated earlier I'm yet to spar with it, but I have training tomorrow and I intend to break it in hard to see what it can do. If it holds up to first impressions I will be a very happy customer indeed. I will update this thread with my training results and take pictures of any dings that will inevitably happen. Although at 52 rockwell I'm confident that the steel will hold up very well in steel on steel contact. Overall I'm very pleased with my purchase and with Armory Marek as a vendor and look forward to coupling this with my continental mercenary kit for my group. That's a screaming deal for 250 Euros. Wow. What was the turnaround time on the project like? Big backlog of projects? His turnaround was really good actually, I first placed the order on the first of January, he quoted me the price and I paid him on the 15th of January and he'd finished and posted the blade on the 25th of January. Delivery took 11 days between posting and delivery. Was very impressed considering his website said it's only a 12 man team. 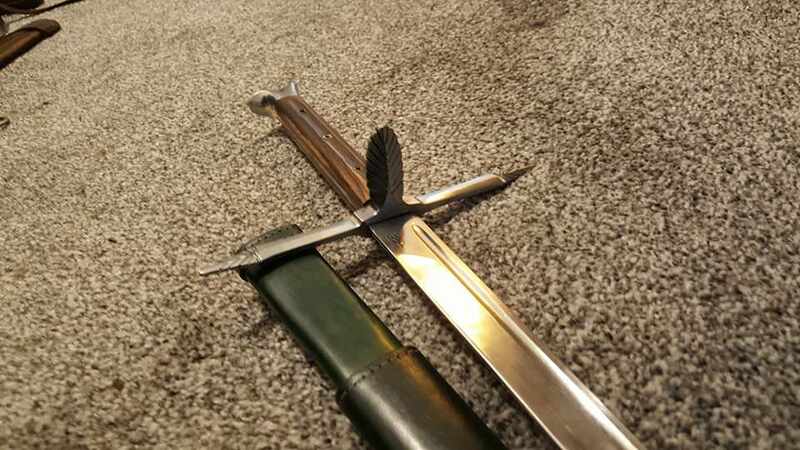 Unfortunately didn't get to have a proper bash with it today due to rough weather conditions, but have done some light sparring and technique work with it and there has been no tenable damage to the blade, just slight "scuffs" where the blades connected, no sign of a visible dent. If you want to check out his other products (I realize that I hadn't included his website in my original post). Looks very nice Kristian, nicer than many of the photos on the site in fact. If you have a ruler or calipers on hand, would you mind providing some measurements of distal taper? I've thought about ordering something from Marek in the past but have been waiting to find out more. I took the measurements of the distal taper, It appears that at the crossguard the width is 4 mm, it's 3mm at 25 cm and 50 cm and 2.5 - 2 mm along the course of the clipped point. Despite not having much of a distal taper, it still feels very lively in the hand however, similar to how my longsword feels (which does have a pronounced distal taper. So these are the results from my first proper spar with the new Messer, including some intentionally hard strikes to break it in, although I'm cringing slightly at the burrs, I'm fairly impressed as it was a high intensity session plus the aforementioned hard blocks and strikes. I can only imagine after the burrs have been cleaned up with some light filework the damage will be minimal, as the actual "dents" are a fraction of a millimeter deep. If it behaves like any of my other blunts, it should work harden with use and create a much stronger edge. Verdict - Fairly impressed despite my initial cringing at breaking this beauty in. Several years ago I purchased a godenak from Marek, and the experience was excellent. The communication was excellent, the weapon itself was very nice. My only complaint was that I assumed that all weapons were sharp by default, but my weapon from Marek arrived as a blunt. That was my mistake, not specifying sharp or blunt. Update: I informed Armory Marek the concern i had with the grip, he seemed very concerned and asked for more details and after described how i should fix it if i dont want to send it back and offered to repair it himself for free. The fix is pretty simple and honestly the fault could be more in my head, as the creaking could be a feature in the wooden grips themselves; But still, good to know that if it becomes a real issue that he will repair it for me.